A group of Senior National Security Officials join General John F. Kelly upon his arrival in Belize. "U.S. Marine Corps General John Kelly, Commander of U.S. Southern Command (SOUTHCOM), departed Belize today after a two-day visit that included meetings with senior Belizean and U.S. Embassy officials, as well as visits to security installations around the country. 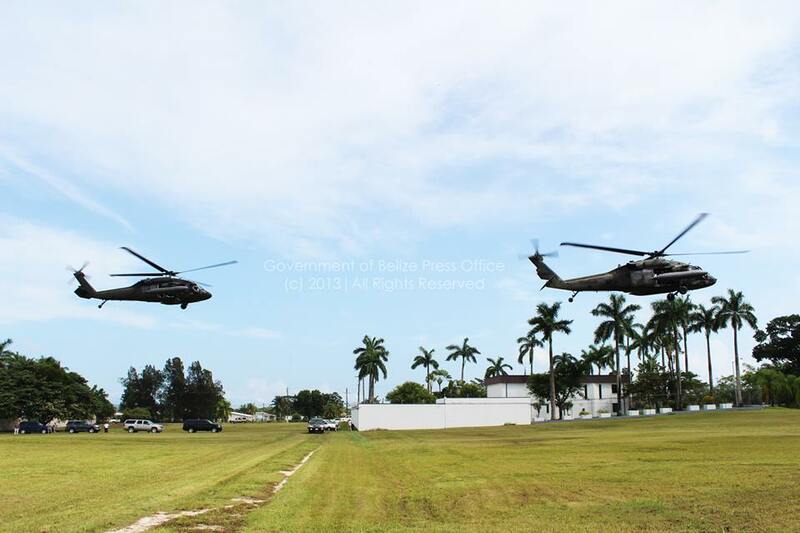 This is General Kelly’s first visit to Belize since becoming SOUTHCOM’s Commander in November 2012. Previously, he served as Senior Military Advisor to U.S. Secretary of Defense Leon Panetta. Kelly visited Price Barracks on September 4, where he met with Brigadier General David Jones, Commander of the Belize Defence Force, to discuss security challenges of concern to the U.S. and Belize, bilateral military cooperation, and U.S. security assistance. While at Price Barracks, the General visited the Belize Defense Force’s Joint Operations Center, being completed with U.S. and Canadian assistance to help Belize oversee future coordination between law enforcement, coast guard and defense forces supporting counter-narcotics operations. Kelly also visited the Forward Operating Station in San Pedro, where he discussed maritime security cooperation with Rear Admiral John Borland, Commander of the Belize Coast Guard, before touring remote regions patrolled by Belize’s defense and security forces. Earlier today, the General met with senior civilian leaders at the Ministry of National Security to talk about the defense partnership, security engagement and joint activities between the U.S. and Belize, including the recently completed humanitarian assistance exercise New Horizons, which contributed to the well-being of the Belizean people and afforded both of our military forces opportunities to sharpen their skills while gaining valuable experience. A similar New Horizons exercise is scheduled for 2014. At the U.S. Embassy in Belmopan, Kelly and U.S. Chargé d’Affaires Margaret Hawthorne, spoke of SOUTHCOM’s support to U.S-Belize relations. Following today’s meetings, the General also traveled to southern Belize, where he observed an ongoing riverine training activity involving U.S. and Belizean personnel. 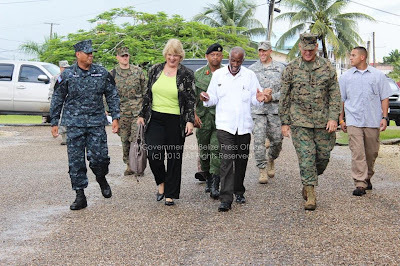 The U.S. and Belize enjoy a long history of active military cooperation that includes bilateral training, exchanges, seminars, exercises and operations aimed at addressing security challenges, improving interoperability and strengthening key capabilities." Via Jose Sanchez's Facebook page.